Sto Len offered an on-site performance and watery séance. From his boat, the artist asked the creek for forgiveness while creating a ceremonial print in its honor. 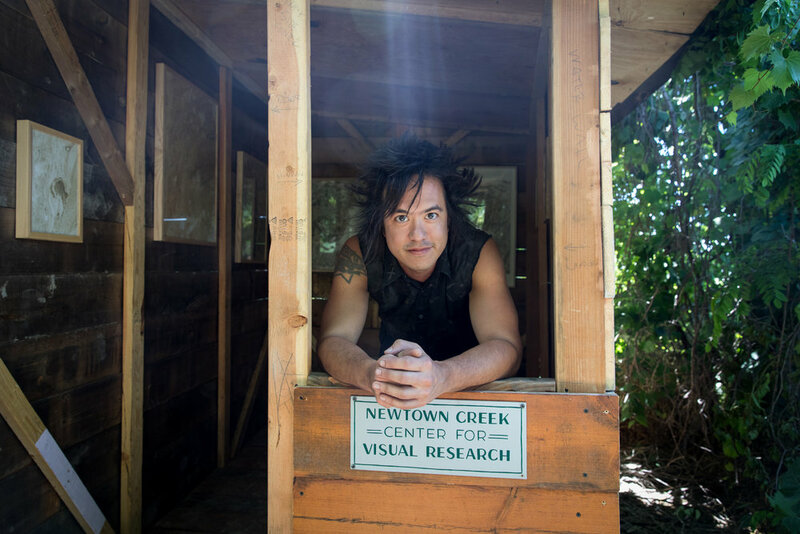 For the past two years, printmaker and performance artist Sto Len has been creating mono prints on Newtown Creek in Maspeth, Queens (which was originally called Mespeatches by the Native American tribe of the same name who lived in the area). Mespeatches translates to “at the bad water place.” Working en plein air from a rowboat, Sto uses a process similar to paper marbling to print directly off of the patches of oil and debris floating on the surface. The resulting works are both beautifully patterned and effectively troubling as they offer us a grim reflection of an environmental disaster many would rather ignore. 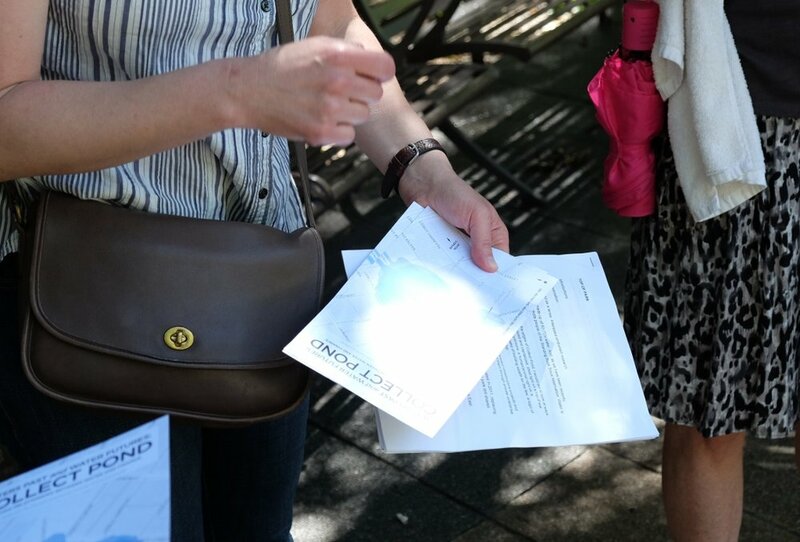 Interdisciplinary Artist Rachel Stevens led a walking tour and discussion about Collect Pond, tracing the edges of this lost body of water and unpacking histories and futures tying water to finance and speculation, from Collect Pond to Hurricane Sandy and beyond. Since Europeans arrived in Lower Manhattan, water has been a contentious commodity and continues to be a flashpoint for struggles between private enterprise and human rights. Collect Pond, a 48-acre, 60- foot deep freshwater pond, used to occupy the land from the court houses to the edge of Chinatown in Lower Manhattan until it became polluted and then filled in. Chase Company, founded by Aaron Burr, was a private water distribution company that hoarded profits meant to provide clean water from tributaries feeding Collect Pond and used those funds to start Chase Bank. FDSE led a special walk to launch their audio tour of New York's Whale Creek, a tributary of Newtown Creek, a waterway hidden in plain sight. The concept of “dark ecology” brings people, actions, and ecologies into one sphere, in which our tangled cultural and natural histories are available to be reimagined. Field Guide to the Dark Ecologies of Newtown Creek is intended to serve the communities at stake, and to use the affective strengths of art to forge a fair and creative model of how to live and work together alongside brownfields and Superfund sites. This guide addresses the complexities of this post-natural landscape, and empowers citizens to imagine the waterway's future. Download the Field Guide to the Dark Ecologies of Newtown Creek for free, online. 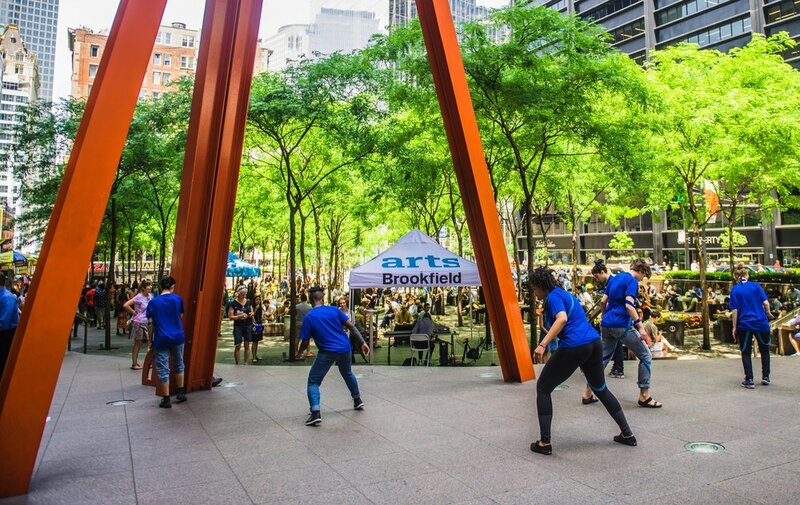 36.5 / Mannahatta was a one-time performance in Zuccotti Park that invited performers to connect with the tidal shift in the water surrounding the city and the streams below that were buried under layers of dirt and concrete long ago. The movement is based on a portion of Sarah Cameron Sunde’s ongoing series of works, 36.5 / a durational performance with the sea, in which the public is invited to participate by standing in the water for an extended period of time and by marking the passing hours on the shore with a series of choreographed movements. There seems to have been a major expansion of artists working in, on, or with water over the past few years. Artists are building boats and taking people on tours, sculptures are being installed in rivers and oceans, and performances draw audiences to the waterfront. Many artists are at least partly responding to the vulnerability of water to industrial pollution and climate change. The panel considered the environmental, social, and technological changes that have sparked the new water art movement. At 2,200 acres, when it is completed Freshkills Park will be almost three times the size of Central Park. The transformation of what was formerly the world’s largest landfill into a productive and beautiful cultural destination —the largest park development in New York City in over 100 years—makes the park a symbol of renewal and an expression of how our society can restore balance to its landscape. Mariel Villere led a special tour to visit closed sections of the landfill-to-park project. Artists and storytellers have long drawn inspiration from New York's cityscape. But under the waters that define our islands is another landscape entirely, every bit as gritty and urgent, as lonely and cluttered, as deadly, nonsequitous, singular and siren as the City itself. Nicki Pombier Berger and Helen Georgas, editors at Underwater New York’s a digital journal of writing, art, and music are inspired by the waterways that surround New York City and the objects submerged within them. They led an exploration and residency at Coney Island Creek. Participants explored and created. See what came of it here. Opera in the Shower is a playful meditation on the use of water in our daily lives. Opera in the Shower was inspired by Helen Banner’s concept of a “medieval water opera”. It is part of the Arts Brookﬁeld Series at Zuccotti Park. From 1985-86 Mary Miss was the lead on a ground-breaking collaborative design team with architects Susan Child and Stan Eckstut. Coinciding with the development of former landfill site Battery Park City, they created South Cove, one of the country’s most significant public artworks. Called ‘The most environmentally sensitive major sculptural enterprise that New York City has been offered’ by New York Magazine’s Kay Larson, its winding boardwalks, quay and jetty recontextualize the view of New York Harbor and reconnect residents with the water. Miss invited participants to join her on a walking tour of South Cove to learn about her involvement 30 years ago, current thinking about the site and our relationship with water. Nancy Nowacek makes art that overlays the politics of the body and the politics of space. In The Play About the Bridge, two actors and two chairs traverse the incalculable span that unfolds in an attempt to walk 1200 feet. The work reimagines Nowacek’s project, Citizen Bridge, a quest to build a bridge to reconnect Brooklyn and Governors Island, once connected by a walkable sandbar at low tide. It is a dream that pits a clear and simple vision against the forces of the water, the fine print of governmental policy and the flows of capital. Success and failure lose all meaning. Time is the only truth, and yes marks the end, always just out of reach. Lise Brenner with C'naan Hamburger, Carmen Bouyer,Meryl Ranzer, Brad Marshall, Rae Richards, Sarah Olson and Alyssa Fridgen, Arielle Lawson, Seth Wandersman. 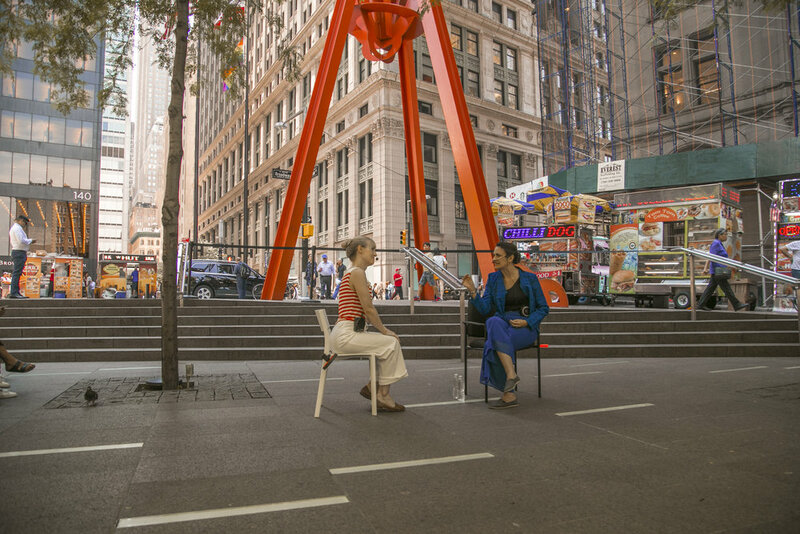 A half-dozen New York artists imagine the past and the future of Zuccotti Park in real time, evoking the streams that were buried underneath Manhattan, the shipwreck that was found underneath the World Trade Center site, and the potential impact of rising sea-levels. Plein Air the Future, envisioned and organized by Lise Brener, was part of the Arts Brookﬁeld Series at Zuccotti Park. TRYST invited participants on a roving future history of lower Manhattan, walking through an imagined tomorrow and discussing how the city landscape will change over the coming years. Sea levels are rising, and New York City is surrounded by a series of complex waterways. The borders of Manhattan island have been expanded through landfill and soil scavenged from construction, covering over creeks and streams. Marshes have been drained and filled and formed into streets. During Superstorm Sandy, the highest flood tide came up to the level of the pre-contact island, a premonition of what is to come. When the water rises again, what will the tip of Manhattan become? Venice in Battery Park? A series of creeks all through the Financial District? Sunk Shore invited us to embody and invent the new watery reality through observation, physical adventure, and a series of pop-up interactive shared imaginings of a future existence. * Arts Brookﬁeld presents exciting, world-class cultural experiences to hundreds of thousands of people for free each year in both indoor and outdoor public spaces at Brookﬁeld’s premier properties.